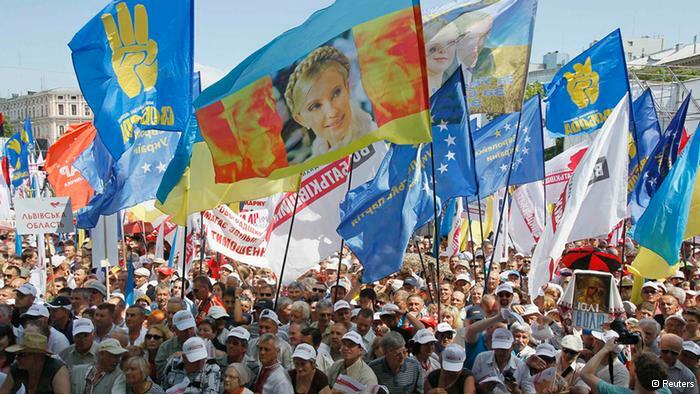 KIEV, Ukraine -- Thousands of people have attended large rallies in Kiev in opposition to Ukrainian president Viktor Yanukovych, calling for the release of jailed former PM Yulia Tymoshenko. Some clashed with Yanukovych supporters. Saturday's event was held after the European Court of Human Rights ruled in April that aspects of Tymoshenko's detention were unlawful. She was sentenced to seven years in prison in 2011 for abuse of power in a case many have called politically motivated. Television footage showed young men hurling stones and water bottles at opposition protesters before being pushed away by riot police. Some protesters tried to drag the crew off a military vehicle that displayed messages mocking opposition leaders. Police said they had intervened to end the fight, which is understood to have happened a block away from the main opposition rally. "Several people have been injured," police announced in a statement. World boxing champion Vitali Klitschko was one of those marching. His UDAR (Punch) party has joined Tymoshenko's opposition group in parliament. He said Ukraine's attempts to join the European Union would not come to fruition so long as Tymoshenko remained behind bars. "How can this happen if we still have political prisoners?" Klitschko asked. "This is why I say: freedom for Yulia." There have been rallies across Ukraine organized by Batkivshchyna (Fatherland), UDAR, and the far-right party Svoboda, with demostrators accusing Yanukovych of failing to do more towards European integration, one of his declared goals. The three parties said on Saturday they would work together to defeat Yanukovych in the presidential election in 2015, where he is expected to seek a second term. Tymoshenko was a leader of the Orange Revolution protests of 2004, which derailed Yanukovych's first bid for the presidency. The European Union has delayed signing a key trade agreement with Ukraine until Tymoshenko and several of her Cabinet allies are released. The agreement would serve as the first step towards potential membership of the EU. On Saturday, Yanukovych's Party of the Regions also held its own rally in Kiev, condemning what it has declared the rise of "neo-fascism" in Ukraine.